My jewelry often starts conversations because the focus is on whimsy and playfulness. Many pieces have hidden features that involve movement. 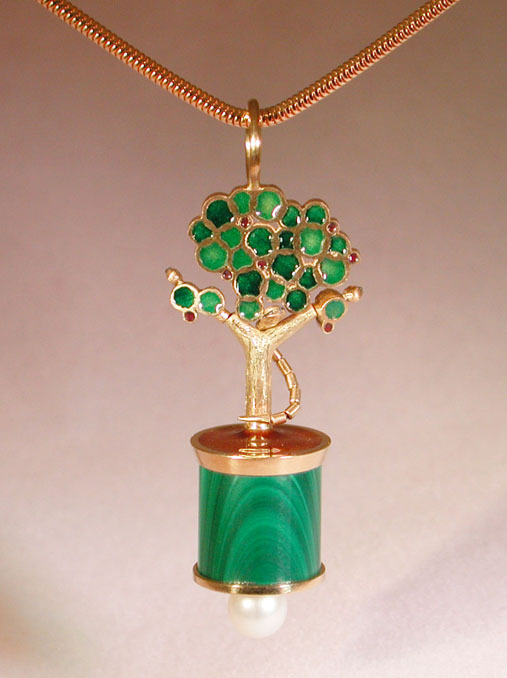 As an example, the miniature Tree of Knowledge Pendant below has a snake that moves and branches that bend. The majority of my work is made in 18K yellow gold and uses the casting process from wax models. I am also a lapidary, so I cut most of the gems I need for each piece. The links for Puppets, Jewels, or Other Toys (at your left) will show you just a few samples of my pendants, highlighting the range of possibilities for the rings, earrings, bracelets, and brooches that I also make. Welcome! © Grant Robinson. All rights reserved.